for all you die-hard Minesweeper players! Hover over the image, please wait patiently for the hover image to load. Click to view in full-resolution. Almost like Sokudo Sudoku! I wonder what happens if I pick 4 8 15 16 23 42? You may also notice the CPU usage spiking, and undoubtedly, it is because of the numbers. We realize this is slow, and it’s painful to wait for speech to number all the items here. 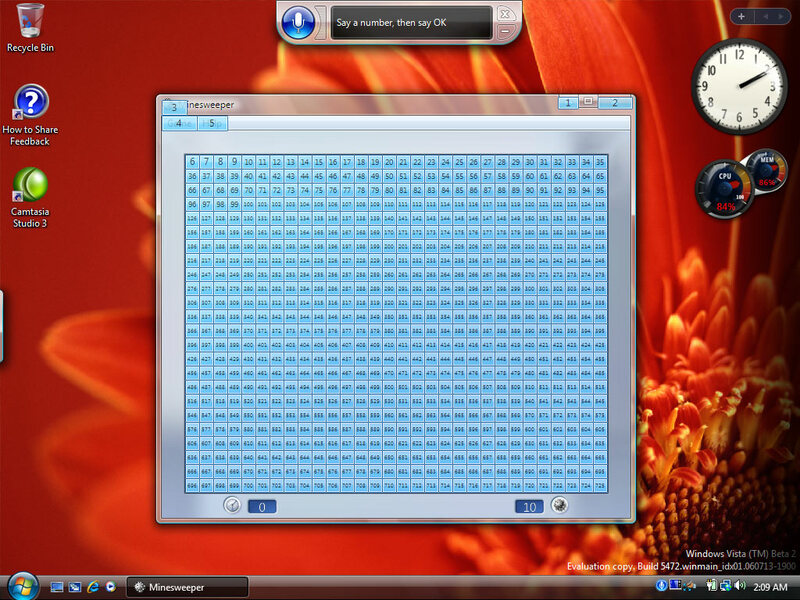 BUT, this works really well if you play with the smaller version of Minesweeper (Beginner). And you’ll see that speech is actually quite cool for playing minesweeper. Still, there is a major drawback: the columns and rows aren’t numbered, so you have to count them yourself. Playing games wasn’t a scenario we really focused on when we created Vista Speech Recognition. For future versions, we’ve added a flag to the system to allow other applications to see that speech is running. These applications can then optimize their functionality for speech. In the case of Minesweeper, this may mean numbering columns and rows when they notice speech is running. did your cpu usage really go up that high?